I've been doing this so long that it's hard to pile on the superlatives, but here we are in 2019 and another Long Beach Show will shortly go into the books. We are in the midst of a mini-bull-run in the metals and I predict this will be the beginning of one of the last upturns in the rare coin market. After several years of a basic side-ways market, we will now see an upturn that many will look back on as a bargain period that should have been obvious to all who witnessed it. If you have the nerve and the capital, now is a great time to take a chance. I cannot guarantee anything; I can only give you my opinion and that is that this could be one of the last great bull-market beginnings for those who are willing to step out and take some risk. Beyond that, this could be one the rare Long Beach weeks wherein the bullion market shows a positive gain. At any rate, if you're in town be sure to stop by and say hello at TABLE 934. Best wishes in all your endeavors! Busy Into the New Year!! It's hard to believe, but it's 2019, a date which somehow seems futuristic to me!! This week will mark the first (and some say, "The Best") show of the year. Florida United Numismatists (FUN) will be putting yet another world-class coin convention in Orlando, Florida. It will be held in the convention center on International Drive in halls WA1 & WA2 which is across from the old Peabody (now Hyatt Regency Hotel). My table is virtually in the center of the floor at #628, so if you're attending, please stop by. This promises to be a busy and active show which will kick off the New Year and I hope to see you there! As we head into the holiday season, much of the rare coin industry is winding down. However, this week finds me travelling to Las Vegas for the CK Show at The Palace Station. This is a new venue with new dates and promises to be a good finale to the year. Stop by table 604,​ if you're in attendance. Hope to see you there! Over 40 years of attending Long Beach shows, adds up to a lot of coins passing through my hands. Labor Day will precede this year's 3rd and final Long Beach, but as always I'll be at my TABLE 934. There'll be some interesting coins in my showcases, both U.S. and World so be sure to stop by. This show will also mark the launching of a new website for the National Silver Dollar Roundtable (NSDR), for which I serve as treasurer. It promises to be an exciting and viable website for everyone, dealers and collectors alike. Be sure to check it out: www.NSDR.net Please be sure to stop by! The home of America's first mint served as backdrop for this year's American Numismatic Association's "Worlds Fair of Money." By all accounts it was a successful show with an incredible array of rarities on the floor and passing over the auction block. The finest of 5 known 1913 Liberty nickels sold for $4,560,000. I had the privilege of shepherding a seven-figure collection through grading, consigning and ultimately sold at the show. A highlight was an 1811/0 Large Cent which last sold for just over $40,000. At least two eager bidders drove the price to $102,000, surprising nearly everyone in the room and pleasing my consignor! This show provided a fair amount of emotion for me as well. 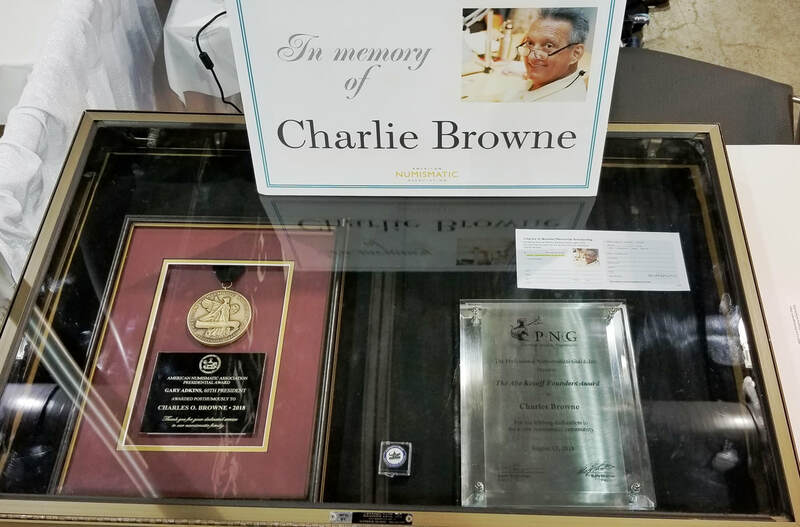 The Charles O. Browne Memorial Scholarship continues to gather steam and the exhibit at my table attracted more generous donations which will send one young person each year to ANA's Summer Seminar for the next 13 years, representing the time Charlie taught the "Advanced Grading and Problem Coins" class. I had the great joy and privilege of sharing that task with Charlie over the last 7 seven years. All who knew him continue to miss his great smile and endless enthusiasm for the field of numismatics. He was posthumously awarded the Abe Kosoff Founder's Award by the PNG which I accepted in his name and is pictured below, right. The Anti-Counterfeiting Task Force (ACTF), a subdivision of ICTA has made some fabulous inroads since its inception just last year. 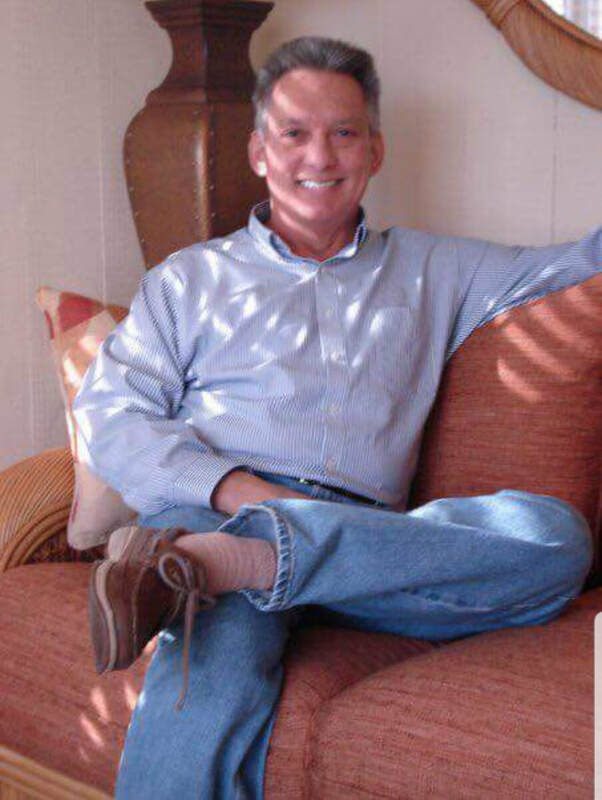 The result of the passing of another very close old friend, Alan Kreuzer, ACTF began with a generous contribution from his daughter Chandra. This year the Al Kreuzer Memorial award went to 3 persons, all of whom were participants in the breakup and arrests of a $48 million counterfeiting scheme involving coins and bullion items. Rich Weaver of Delaware Valley Rare Coins deserves special praise for his efforts which began when a series of counterfeit silver dollars came into his store. 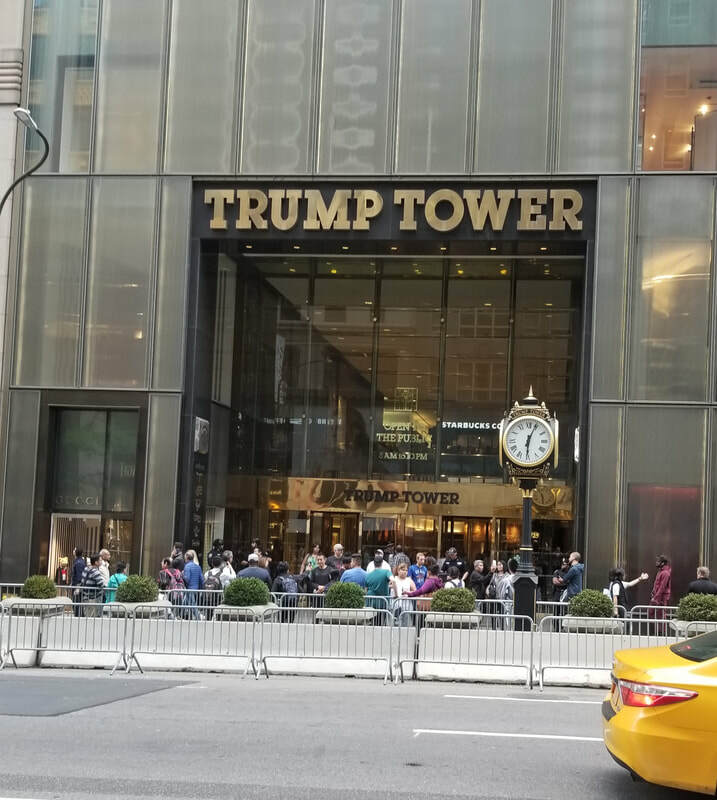 After months of investigation involving Homeland Security and other agencies, these crooks were stopped in their tracks. Our industry faces critical challenges in the future and ACTF couldn't have come into existence at a more opportune time! 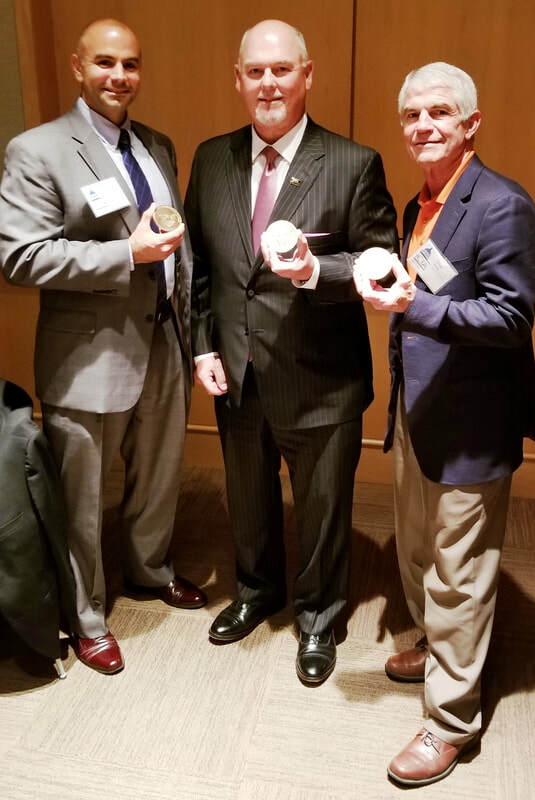 Above are the three award winners, from left to right: Nicholas Tranchitella, Homeland Security Agent, Rich Weaver, proprietor Delaware Valley Rare Coins, and Doug Davis of Numismatic Crime Information Center (NCIC). The Summer months have surprisingly been quite busy, well beyond expectations for most. I have been involved in two active Expert Witness cases with one waiting in the wings and am managing a substantial coin collection containing both U.S. and World coins. On Sunday, I will arrive in Philadelphia for the American Numismatic Association (ANA) convention which is one of the nation's largest and most important coin shows. Monday will be PNG Day (Professional Numismatists Guild) wherein attendance is by invitation from PNG member-dealers. I will be at TABLE 912 and if you're in town and didn't get an invitation, call or text me and I'll be glad to bring an invitation to the opening of the show at 11 AM on Monday in Hall D of the Pennsylvania Convention Center. PNG Day will end at 5 PM giving you 6 hours to get first jump on some of the choicest items available in the numismatic marketplace. The ANA Convention itself will open at 1 PM Tuesday, August 14 and continue until 4 PM Saturday. Stop by TABLE 955 during the show and if time permits, I will be glad to offer FREE APPRAISALS for a small group of coins on the spot OR arrange for a comprehensive appraisal at a substantial discount. However, YOU MUST MENTION THAT YOU SAW THIS OFFER ON THE WEBSITE!! This convention promises to one of the biggest and best in recent years, so I hope to see you there! The Central States Show in Schaumburg wrapped up almost a month ago and was successful by most accounts, albeit somewhat sparsely attended. It is always a great wholesale show with major dealers and marketers able to pick up inventory for their clients. 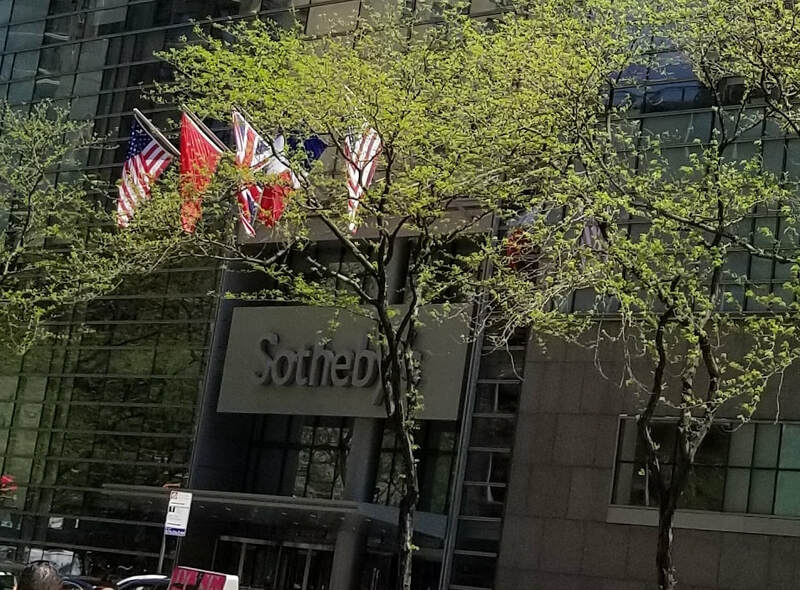 Last week I flew to New York to view the lots for the upcoming sale at Sotheby's on May 21. For the Morgan Dollar collector who is looking for coins that are seen perhaps every other generation, this sale will fit the bill. Many fabulous rarities, not the least of which is what I call a "fantasy piece:" 1884-S MS-67 PCGS/CAC. This coin is truly unbelievable and no other coin of this date comes close! I had the privilege of viewing the lots for a prominent Registry set collector who plans to spend quite a bit in the sale. As I write, I have an early morning flight to a major U.S. city where I will be viewing a 7-figure collection which will be for sale and/or possible public auction. Spring is usually the busiest part of the year and 2018 is no exception. Next show on the schedule is the legendary Long Beach Expo June 13-16. Drop by table 934; I hope to see you there!! DH Ketterling Consulting LLC is pleased to provide our new website to help buyers and sellers of rare coins, paper money and bullion be comfortable with all types of numismatic transactions. Please take a few minutes, browse the site, and discover why our services and Don Ketterling's expertise are more valuable than simply the ability to buy and sell coins. Whether you've inherited a coin collection and need to have it appraised, want advice on having your coins authenticated by a third-party grading service, need help with the auction process or even an expert witness, Don Ketterling will provide the services you need. 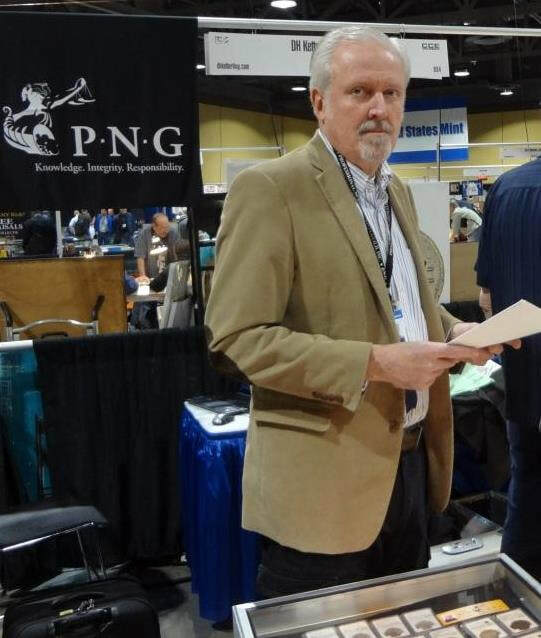 Within the numismatic community and to his customers, Don is known for his integrity and his knowledge. With a half-century of professional experience, nobody is better equipped to help you negotiate the tricky numismatic marketplace. For more information or to schedule an appointment with Don to discuss any coin- or paper money-related topic, we encourage you to use the Contact page or call us at 818-632-2352. ​We hope you'll check back often!